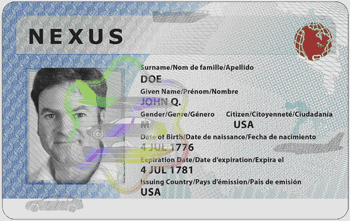 The NEXUS Card gives U.S. and Canadian citizens pre-approval when entering Canada or the United States at all participating NEXUS air, land and marine ports of entry. Picture a massive line up at the Canadian border - either at the airport or at a land crossing - and you and your NEXUS card simply pass by everyone to get into the tiny "NEXUS Card" line. You can save hours. Anyone can apply for a NEXUS card. You don't even need to travel often - just as long as you're willing to pay the $50 cost and can attend the interview. The NEXUS Card application process involves completing a questionnaire to determine eligibility, paying a fee and attending an interview. Successful applicants, once they've received their cards, can take advantage of faster, more efficient Canada/U.S. border crossings at participating airports, vehicle crossings and waterways. To register as a GOES user, you must complete some basic information and create a password, which you should write down or store. Login and Complete the NEXUS Card Application: Once you've registered as a GOES user, you will be given a unique GOES User ID. Again, write down or store this ID. It will also be emailed to the email address you provided when registering.The NEXUS Card application involves answering questions about personal attributes, residency, citizenship, employment history, travel history, criminal record, etc. You will be asked for such things as passport, driver's license or visa numbers, so have these documents handy. Submit your NEXUS Card Application Fee: The final part of the online NEXUS application process is to submit a non-refundable fee ($50 as of 2012) by credit card or from a U.S. bank account. Schedule an Interview: After you've submitted your application and paid the fee, you will receive an email telling you if your application has been conditionally qualified or not. This takes at least 6 to 8 weeks (mine took 10). If you conditionally qualify, you will be asked to schedule an interview with at an enrollment centre - most of which are located at border crossings or airports.The NEXUS Card interview involves answering basic questions about your NEXUS Card application as well as an iris scan and photo. You will be interviewed by two border control officers - one from Canada and one from the U.S. The interview process takes about 30 to 45 minutes but build in wait times. Wait 7 to 10 Days for Your Card to Arrive: You should receive your NEXUS Card in the mail 7 to 10 days after a successful interview. Some enrollment centres may be able to provide your card at the interview. Kids 17 and under may apply for their NEXUS Card at no cost. So if you are a parent applying for your own NEXUS Card, you might as well get the kids theirs at the same time.